With mixed feelings I am both exited and upset that it is 6 weeks to go till my cruise on the Emerald. The sad feelings are based on the fact. that in 8 weeks time, the ship will pass back to Lois Cruise Lines and no longer be available for my yearly or twice yearly holiday. The good feelings are that I will see all my friends again, enjoy 2 weeks sailing on the friendliest ship on the Eastern Mediterranean. I am also taking the opportunity to renew my wedding vows, as we honeymooned on the Emerald, I was going to wait until our 10th anniversary to do this, but as the ship will be gone i’ve had to push the plans up a year. Following my upset with Thomson, I went into the shop at the weekend to discuss my unhappiness. No joy whatsoever. Talk about changing the subject. However, I am all paid up now, and the annoyance at their spoiling my wifes surprise blessing is negated by the fact that I am on the last cruise of the Emerald. I am able to say goodbye to the lovely ship. A few people have asked if I know if this is definitely the last cruise. Well, as far as I am aware, this is really the end of Thomson’s relationship with this glorious ship. 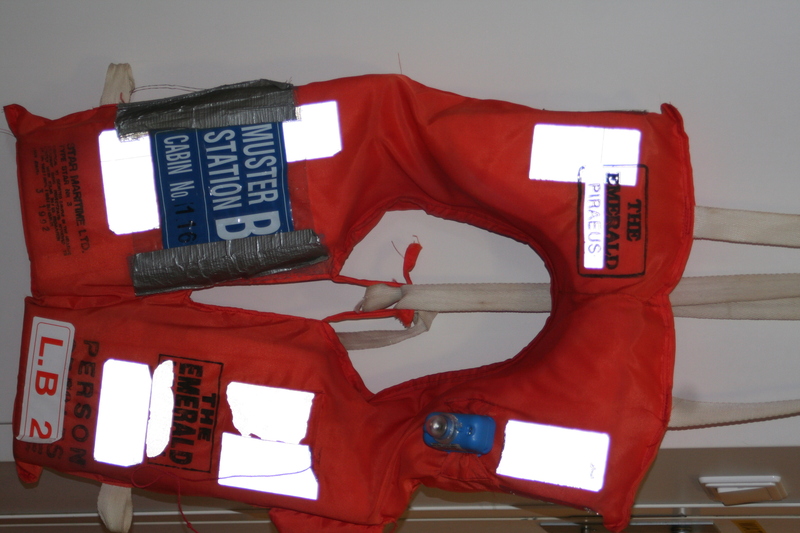 However, I will be keeping an eye on matters as The Emerald will be returned to Luis Cruise Lines, who actually own the ship may possibly be running the ship under their own name. I will update when I know. In the meantime, take a look at a couple of shots from last year. One in Istanbul and the other is my life jacket, which i’ve had for the last 10 years of traveling. I am not a happy bunny today. My ongoing problems with Thomson continue. My local branch seem unable to calculate my bill. sending the paperwork for my surprise of a blessing at sea on the last ever cruise on the Emerald to my wife, who has now had the surprise spoiled, when I was promised by the staff it would be held in the office. Upset, I am very upset that the surprise that I had planned for over a year has been spoiled. No doubt I will be speaking to them today and probably going into the local office on Saturday. Still, nothing would stop me going on the last ever Thomson cruise on the Emerald. And even though my wife knows about the surprise on ship blessing. It’s not long now. The jewel of the Med, the Thomson Emerald will finally leave the Thomson fleet. As you can probably tell, I am still annoyed about this. I am definately on the last two weeks of it’s cruise life. I am even happier that my Greek friend has returned to the ship for the last year, after a short period of time on the Calypso, so I will enjoy myself even more. If anyone knows what Lois Cruise Lines plan to do with her after Thomson’s charter finishes, I would love to know. Also, if anyone else is travelling on the 17th October for two weeks, let me know. Also, if you want cheap car parking at the airport, you can always come to me to book some. What can I say, this is an amazing piece of filmwork, plus excellent feed through of air traffic control chat. The pilots and all staff are so calm and the plane circles and lands. I am afraid of flying but watching the confidence and preparation that the crew show, it makes me feel happier. The last of the original gems of Thomson cruise fleet is finally going at the end of this year. Many people will remember the early days when Thomson really got into the cruise business. These were to name only three. 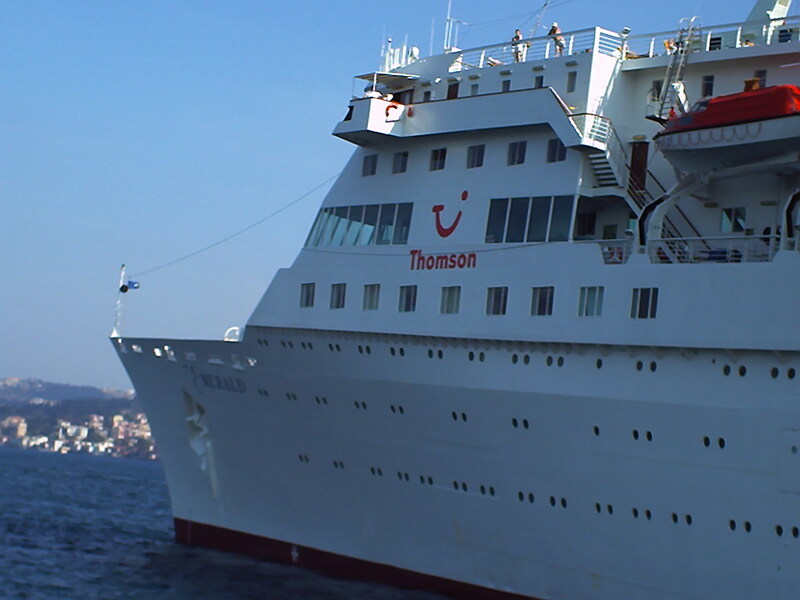 I do wonder sometimes, back when I started cruising, we picked Thomson for the smaller sized ships and friendly staff. They had five ships and terrific routes. Roll forward to the end of 2008 and what will Thomson have? Four ships, less interesting itineraries, some of which (like the Caribbean) are also exact copies of the old 1999 brochure for the Emerald. Also the ships are now flat bottomed large monsters and not so appealing to the classic cruisers. Well, theres nothing we can do about change, if that’s how Thomson think we feel, the best way we can show them it is not, is by going elsewhere. I will be looking at Fred Olsen and Lois Cruises myself. 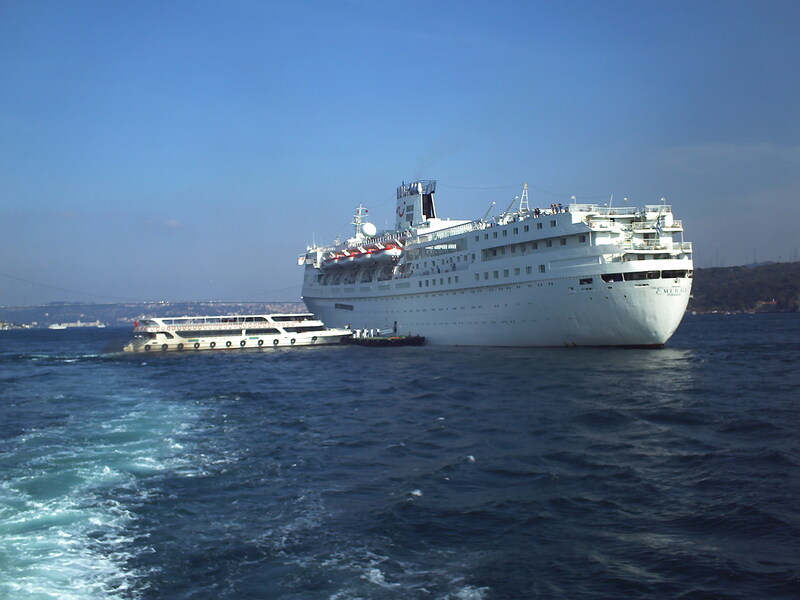 Anyhow, heres a picture of the Emerald, as she was moored in Istanbul in 2007, having just sailed the Black Sea. Thomson (TUI really) have annouced that they are dropping the very popular cruise ship the Emerald. Having been fortunate to cruise on this elegant lady (and the last american built cruise ship afloat) I find this quite upsetting. Additionally, the handling of it, for all the repeat passengers who have travelled every year, sometimes more than that, it’s quite a blow. As it happens, I had already booked the very last cruise, just in case, as I believed they would not annouce it until after the prices go up after the winter, to get as much profit as possible.Whats more upsetting is that there is no farewell cruise, as has been done with the Topaz, another small and friendly ship. It will be interesting to see if there is a customer backlash. Does the choice of a vehicle matter?